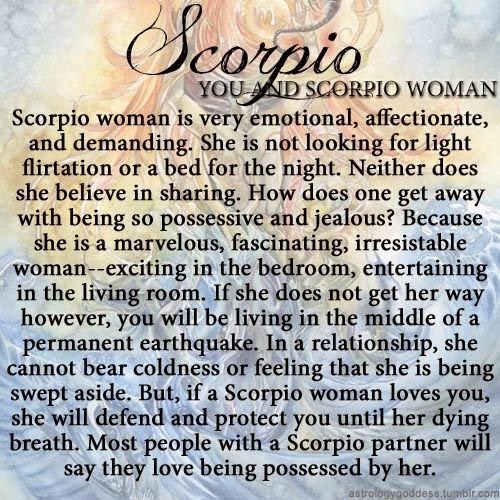 The Scorpio woman is very emotional, affectionate and demanding. She is not looking for light flirtation or a bed for the night. Neither does she believe in sharing. How does one get away with being so possessive and jealous? Because she is a marvelous, fascinating, irresistible woman -- exciting in the bedroom, entertaining in the living room. If she does not get her way however, you will be living in the middle of a permanent earthquake. In a relationship, she cannot bear coldness or feeling that she is being swept aside. But if a Scorpio woman loves you, she will defend and protect you until her dying breath. Most people with a Scorpio woman will say that they love being possessed by her.